Vegetable gardening has grown exponentially in recent years. Why not – you can produce food that is free from chemicals to your family. Gardening is not rocket science, but it is hard work, and you are going to get dirty in it. You don’t need a lot of space to grow fresh vegetables, herbs, and fruits. You don’t really even need a garden. There are plant varieties that can also survive in containers all year long. It is a pure pleasure to bite a freshly picked tomato from your own garden while it is still warm from the summer sun. When you have your private vegetable garden, you can have this pleasure all season round. Have fun, don’t take life, and gardening, too seriously. However, growing a sufficient amount of fresh vegetables every year takes some time and experience. For most of us, becoming a successful vegetable gardener comes after years of practice. Nevertheless, you can reduce your learning curve by employing some proven vegetable gardening tips. Here are five vegetable gardening tips good to know. Few of us are blessed with a generous supply of beautiful, fertile land and topsoil. Depending on where you are living, you may find yourself fighting with harsh conditions, like heavy clay, rocky, sandy or other less-than-ideal soil. Healthy soil means that you can enjoy healthy plants, which resist pests and diseases, reducing the need for harmful pesticides. Each of these soil types gives you various challenges, like retaining too much or too less water, or not having enough nutrients plants need to live. For instance, if you have heavy clay soil, you can’t just dig a hole in the ground and drop a plant into it. Chances are that plant won’t survive. The heavy clay around your plant will work as a water tank. When it rains, your plant will be like in a bathtub. This kind of clay soil doesn’t have anything to drain. Your step number one is to identify the type of soil you have. Then you know what actions to take to improve it. Once you have a better understanding of what you are dealing with, you’ll be able to determine what is needed to change or enhance your type of soil. You can take advantage of vertical space in your garden, whenever possible. You can do it by utilizing netting, fences, and other constructions to keep your weeds off the ground. There are many benefits to raising your vegetables vertically. For starters, you can produce more food in a smaller area. That is great for urban gardens or those with otherwise limited space. Plus, harvesting and weeding around your plants is a lot easier when you are growing vegetables on structural supports. Less bending and stretching is always helpful for your lower back. This is especially beneficial for older gardeners or those with other physical limitations. Raising vertically helps your plants, too. Growing the plants off the ground channels a better air circulation around them. Good air circulation helps to keep fungal infections and pest infestations low. Some plants work well with each other, and some not. 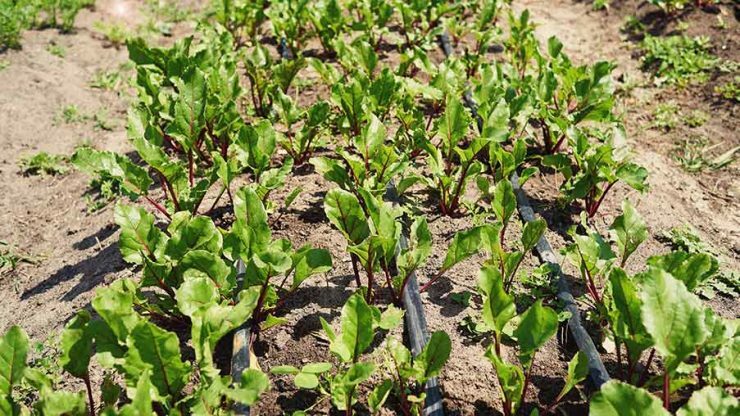 Learning which plants benefit from the proximity of others is a vital step to maximize the efficiency of your vegetable garden. Companion planting is a smart way to improve your harvest. Some plants are especially helpful to one another. It makes sense to group these seedlings together in your garden. attract useful insects into your field. Native Americans usually planted corn, beans, and squash together. Each plant helped the others in some way. For example, the corn stalks gave a framework for the beans to grow up. The squash gave a great weed stop as it spread out along the ground. It is vital to guarantee that your garden is helpful for pollination by creating an ecosystem that drags pollinators (primarily insects). You can do this for instance by mixing some colorful flowers with your vegetables. One of the most valuable allies that your beginner vegetable garden can have are pollinators. You can buy everything online these days, and seed is no exemption. People are selling seed on Craigslist, and there are undoubtedly hundreds of sites where you can buy seed online. Buy your seeds from a trusted source to avoid getting something else than what you ordered. Vegetable gardening is a skill that develops over time. However, there is no doubt that applying these vegetable gardening tips will reduce your learning curve.